Segments are a great way to get involved with fellow cyclists and local routes in your area. 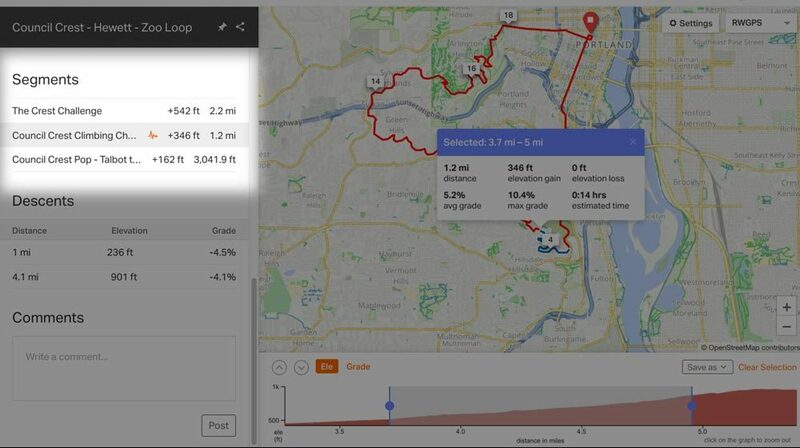 Segments offer a way to measure progress on sections of your favorite rides, or compare your ride times with other Ride with GPS cyclists. 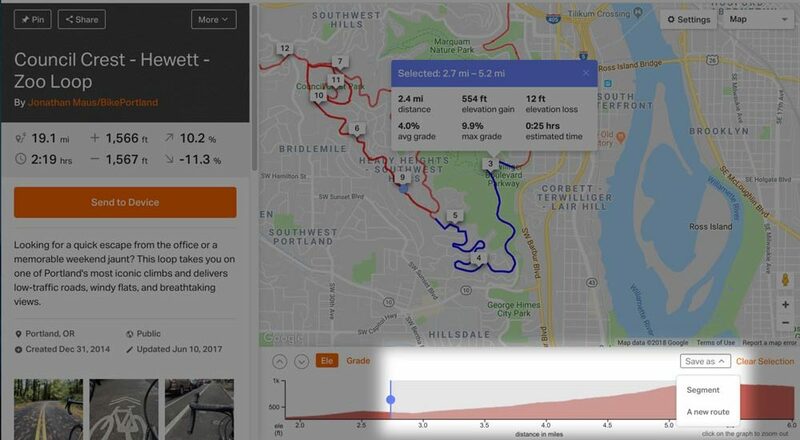 While viewing a Ride or Route, select a portion by clicking and dragging across the elevation profile. Just above the elevation profile, click the SAVE AS button and select SEGMENT. If you make a segment public, you will be able to compare yourself to anyone who has ridden the same segment. Premium members have the capability to make Private Segments. Event Only participants of the assigned event will match to this segment. Once you have created a segment, we will automatically match the segment to all existing rides and routes in our system. This matching may take a few minutes to finish. After you save a new route on the website, a SEGMENTS section will appear on the left panel to indicate there are segments matched on this route. 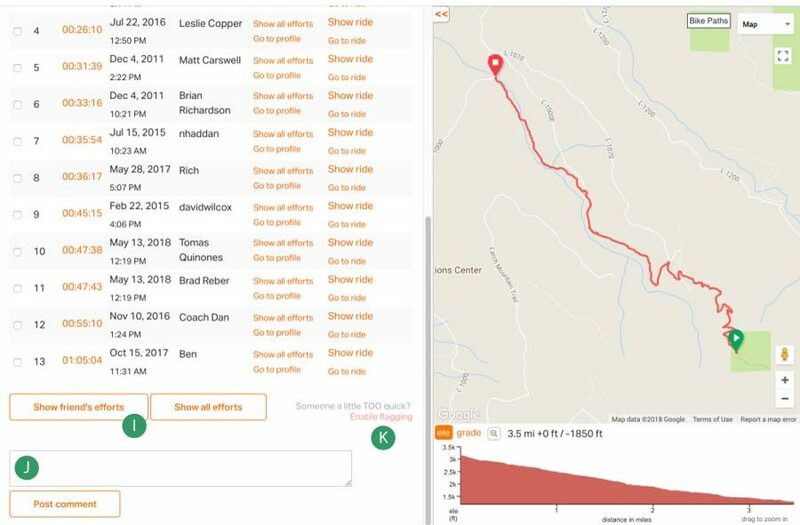 Hover your mouse pointer over the segment to see where it shows up on the route and elevation profile. To view all of your segments, go to your MORE page. Here you will see a list of segments that you have created, or public segments that you have been automatically matched against. Click on a segment to view all of the details. By default, the leaderboard stacks up each rider’s top performance on that particular segment. Click “Show All Efforts” to see the full list of attempts on the segment. You can click on the Time Column to view the details of that specific effort. To view the segment in the context of an entire ride, click “Show Ride”. Pin a segment: Click on this for segments you want to easily keep track of. You will have quick access to that segment from the Pinned tab on your profile. Popularity: This shows the number of times a segment has been pinned or ignored. This will let you know how many people are paying attention to that segment. Ignore segment: This will remove you from the leaderboard, and it will not show up on your rides so you will not receive any notifications. We use this information to help determine segment quality. Sort by: By default, the leaderboard is sorted by rank — fastest times show first. Sorting by date will rearrange the list to show most recent efforts first. Checkbox: Check off efforts, and then you can click on the “Compare Efforts” button to analyze all of the checked efforts against each other, or stage a race. “Toggle Details” will show/hide additional metrics on the effort. User efforts: When a rider has multiple efforts on a segment, you’ll see a link to “Show X Efforts”. Click on that to populate the leaderboard with efforts only from that user. This is a great way to see all of your efforts in one place. When showing user efforts, click “Show Best Efforts” at the bottom left of the table to get back to the screen showing the default leaderboard with all riders. 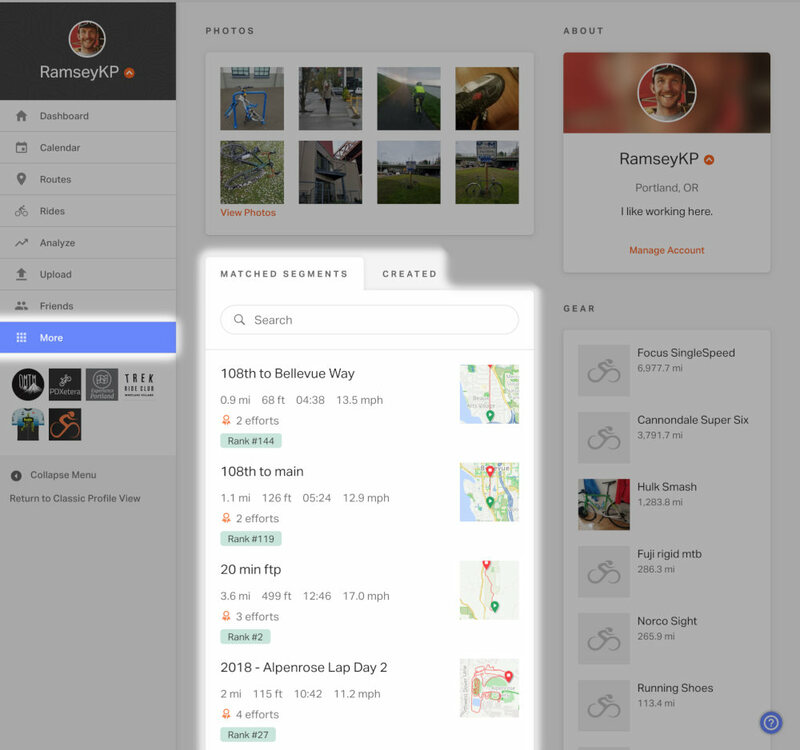 Show ride: The fastest way to view the context of an effort is to click “Show Ride”. This will display the entire ride in the map on the right. Click “Go to Ride” if you want to view the detailed ride page. Segment metrics: Click “Toggle Metrics” to view speed/heart rate/power/cadence information for each of the checked efforts. Show all efforts: By default, the leaderboard only shows the best effort (one entry per user). Showing all efforts displays every public effort, so you will get a longer list that includes everyone’s attempts. 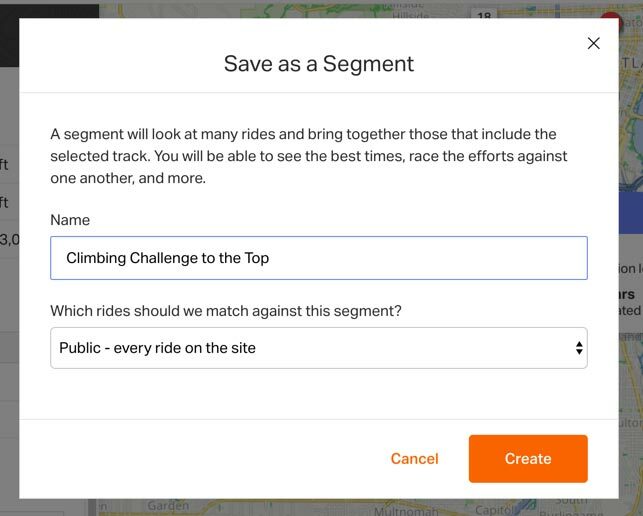 Comments: Add details or have a discussion with other riders about a particular segment. Enable flagging: If you notice something that you think requires attention, such as an unrealistic time, a bad match, etc. click “Enable Flagging” and you will have the option to flag any of the matches, or the entire segment. Compare efforts: This button is available as soon as you check off one or more efforts. It will load the effort comparison tool, which allows you to analyze selections of the effort and stage a race. Toggle details: This will toggle the display of metrics for all of the selected efforts. When viewing a segment, you can check one or more riders and click the “Compare Efforts” button that appears above the leaderboard. The segment is parsed into sections that allow you to see your performance broken down. You can click on a section so you can zoom into it on the map, or stage a race on only that section. Close comparison: Hide the effort comparison, and just show the leaderboard. Split: Split each of the displayed efforts into 2, 3, or 4 sections of equal distance. Effort: This displays the effort split into several sections. The width of the bar is proportional to the time (a quicker section will be shorter). Green indicates you had the fastest time, orange indicates the time is within 20% of the best time from the selected efforts, and red shows the time is 20% or great. The metrics displayed are specific to each section. 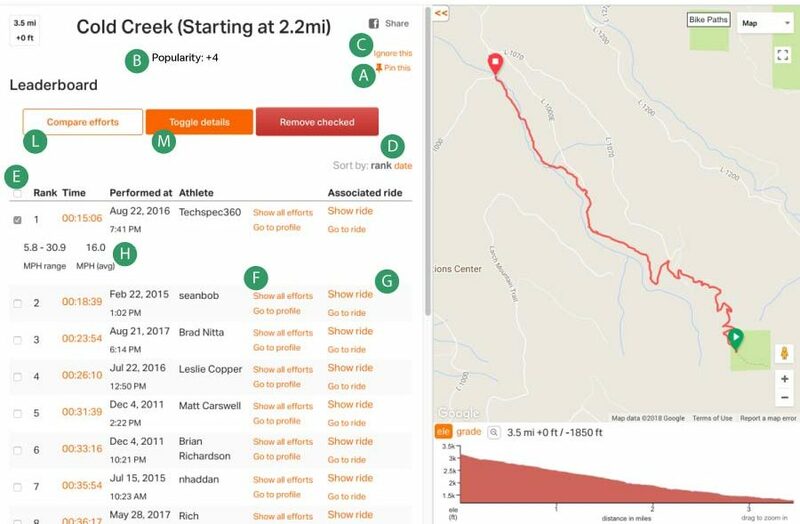 Hover your mouse over a section to see it highlighted on the map, and click on a section to zoom in, and line all of the efforts up on that section for an offset race. Click on a section to select it. Once selected, all of the efforts will line up on the selected section. The map will zoom in on the selection, and it will be highlighted on the selected section. The riders will be offset so they can all start from the beginning of the section at the same time. Playback controls: Before this is displayed, you will need to click the “Stage Race!” button. You can then drag the elapsed time slider around to jump to any spot in time. You can control playback with the play, pause, and stop buttons. Drag the playback speed spider to increase or decrease the speed of playback. Each rider is represented by a color dot on the compared board and the track line when playing back efforts. 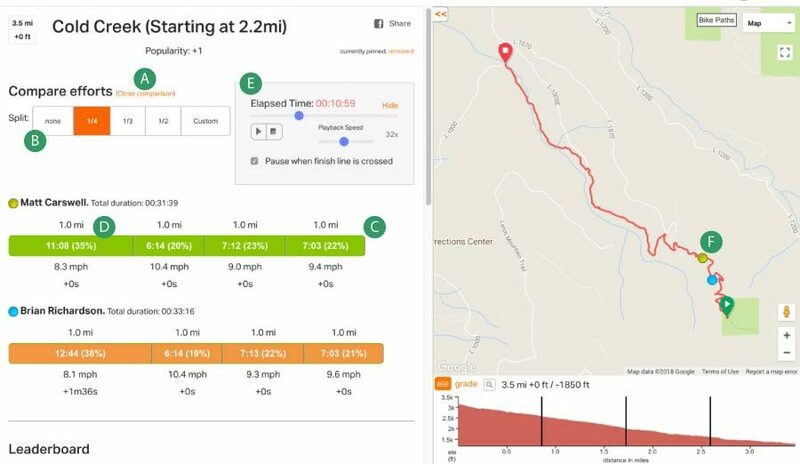 If someone on the leaderboard has submitted data that is clearly unfair, example: They forgot to turn off their Garmin device or didn’t stop recording in the app before getting back in their car to go home. You can FLAG the effort for review and removal. Scroll to the bottom of the list of efforts. This places checkboxes next to each effort. Click FLAG next to the effort that looks unfair to the rest of the riders. After the segment is flagged, we’ll review and remove it as deemed necessary. All members have the capability to prevent their public rides from being matched against segments. 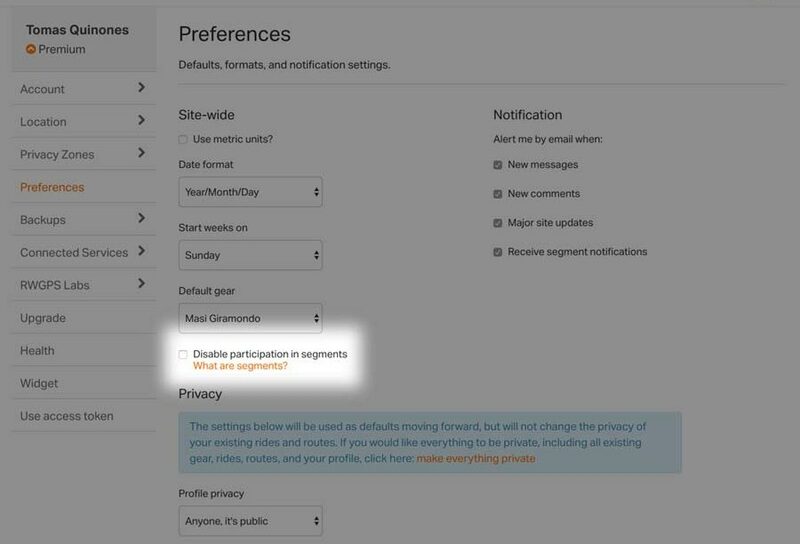 Using this setting will still allow you to use segments privately, but other users will not see you on any segment leaderboards.